Some would say that this blog is all about us blowing our own trumpet. Not so, at least not always so. Here's the proof that other people are quite prepared to blow our trumpet for us, if you will. Guide de Charme (www.guidesdecharme.com) is a guide, or rather a series of guides for smart, chic, cool, elegant hotels, and their latest Paris edition has just started listing apartments too. Guess what? We're in there! As only three apartments were selected this year (and we are number 1) we are rather pleased, and of course honoured. It is, after all, a very posh guide book. 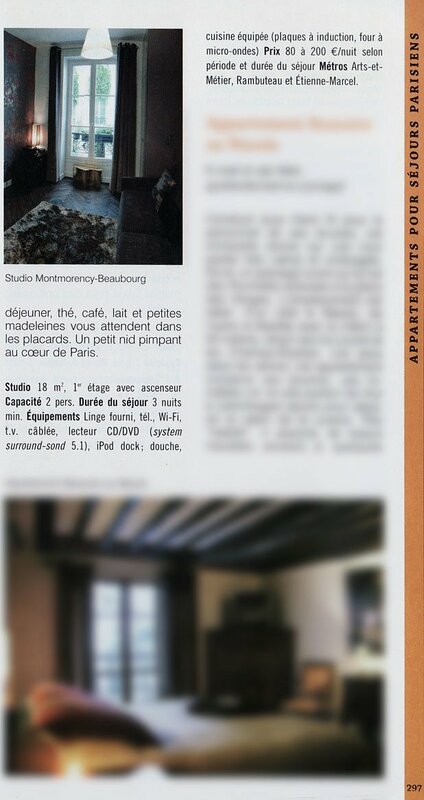 Also, the guide's front cover is a photo by our pal Jérôme d'Almeida who took some photos of the apartment that you can see here. "Very design, very graphic, this 18m² studio two minutes from the Pompidou Centre has been careful to pay attention to a myriad of details concerning comfort and space. Situated on the 1st floor, looking onto a paved courtyard, there's lots of natural light. Period parquet, beautiful wallpaper, designer furniture, a fresh bouquet of flowers, art books, CD and DVD at your disposal, window boxes... a really welcoming atmosphere that gives you the impression of being "at home". The hi-tech kitchen and bathroom fit into just a few square metres at the entrance, and are cleverly placed so as to leave the maximum amount of living space with a bed (top quality) is a sofa that unfolds. There are numerous cupboards and the place is fully equipped: flatscreen TV, wifi, iPod dock, CD/DVD player... On the day of your arrival, the owners - who will give a personalised welcome - can order (with prior notice) food to be ready for you, prepared by the restaurant downstairs. For breakfast, tea, coffee, milk and little cakes are waiting for you in the cupboards. A smart little nest in the heart of Paris." 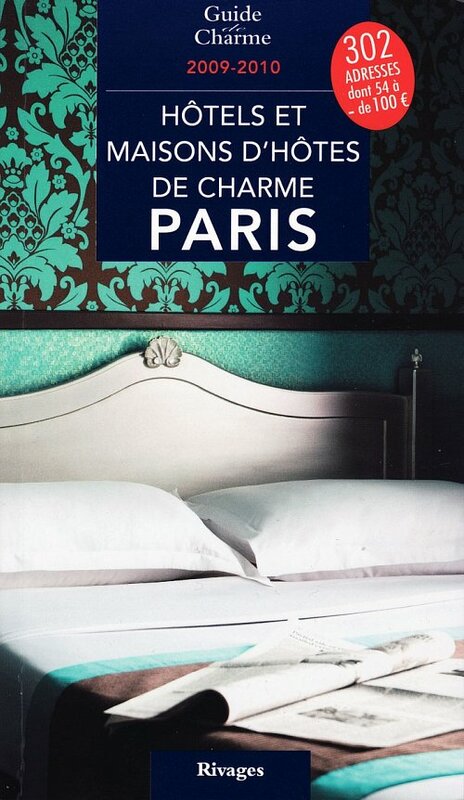 You can buy the Guide de Charme - Hôtels et Maisons d'Hôtes de Charme Paris (try saying that after a few glasses of wine) here at Amazon. 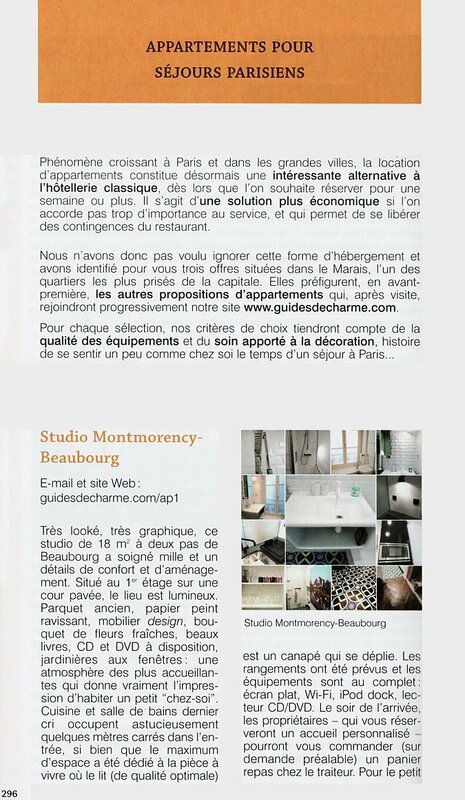 The official Guides de Charme site is here, and their Great Apartment Paris page (or Studio Montmorency-Beaubourg if you prefer) is here.